(4) Figures to the right indicate full marks. 1 (a) What is the need of input offset voltage compensation and how it can be achieved. (5 marks) 1 (b) Design RC phase shift oscillator to produce sinusoidal output of 5KHz. 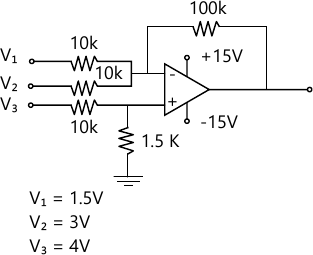 (5 marks) 1 (c) Design schmitt trigger circuit to achieve upper and lower threshold voltage as 1.5 volts. (5 marks) 1 (d) Explain Resolution, Accuracy and settling time with respect to DAC. (5 marks) 1 (e) Design a Flasher circuit using IC 555, in which lamp should remain on for 4 sec and off for 2 sec. (5 marks) 2 (a) Derive closed loop parameters for Inventing opamp. (10 marks) 2 (b) Design a second order KRC low pass filter with a cut off frequency fo=2KHz and Q=5. (10 marks) 3 (a) Design a triangular wave generator to get the output frequency of 1.5 Khz and Vo(p-p)=7.5 V using IC 741. (10 marks) 3 (b) Explain counter type ADC with neat diagram. (10 marks) 4 (a) Calculate output voltage for the given amplifier. (10 marks) 4 (b) (i) Prove that opamp can be used as current to voltage converter. (4 marks) 4 (b) (ii) Compare normal rectifier with precision rectifier. (3 marks) 4 (b) (iii) Define different parameters of PLL. (3 marks) 5 (a) Explain diferent comparators, state different applications and suggest modifications for practical comparator. (10 marks) 5 (b) What are different possible IC 723 based voltage regulators. Design Voltage regulator to achieve Vo=12V and Io=1 Amp. (10 marks) 6 (a) Explain function of each block of PLL. (10 marks) 6 (b) Design voltage Regulator using IC LM317 for the given specifications.